Blegh. I think I need to figure out a new blogging schedule. Sunday evenings just don't work for me at all! Friday evening I met up with J9 for a coffee while she picked books for Book Club (which is on Tuesday evening). And then rest of Friday evening was pretty uneventful. Saturday was equally uneventful. I was woken at midnight by the hectic storm and went to check on the bunnies - since it was loud enough to wake me, I could only imagine what they might be feeling, hearing it thru those giant ears of theirs! And they were quite panic-ed when I got down so I brought them inside and let them spend the rest of the night in our bathroom. But I couldn't sleep very well after that, I got all wheezy and it didn't improve at all on Saturday. I was awake again around 5am on Saturday morning so decided to give up on sleep, since I could hardly breathe and instead started watching movies. 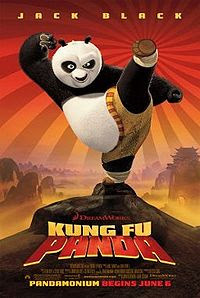 I watched Kung Fu Panda. Meh, it filled the time and I didn't have to concentrate too hard ;) Actually I don't remember exactly what happened in the end so it's highly possible I fell asleep during it. At some more reasonable hour Varen came downstairs too and then he started watching Beowulf. I slept thru that one completely. Although we spent the day doing very little except popping out to get some food, I really needed one of those nothing days and was feeling awful for most of it. Okay, well not awful, but it really does drain you not being able to breath properly for an extended period of time! Sunday was an admin day to make up for our lethargy on Saturday. We did the grocery shopping and cleaned the bunny hutch and I *tried* to get a new pump for the fish tank (was hoping to get new fish too, but the Lifestyle Garden Center was selling their smallest koi for R59 ... hello?!) only to get home and realise I have bought *completely* the wrong thing. I want a pump that aerates the water ... what I bought is a pump the pumps water (don't worry, I have NO idea why anyone needs that either?!). I wonder if they'll refund me? Oh, and I made pizza on Sunday afternoon. The base was 100% to my liking, but I really do enjoy home-made pizza ;) All my favourite toppings in the quantities I like, how can you go wrong?